Chicco Baby Star Piano is a toy that provides long hours of musical fun. The vibrant and appealing Baby Star Piano makes it the most sought after children’s musical toy. It features an amazing built-in microphone with a four mixer function, three modes of play, light effects, nine pre-recorded tunes. 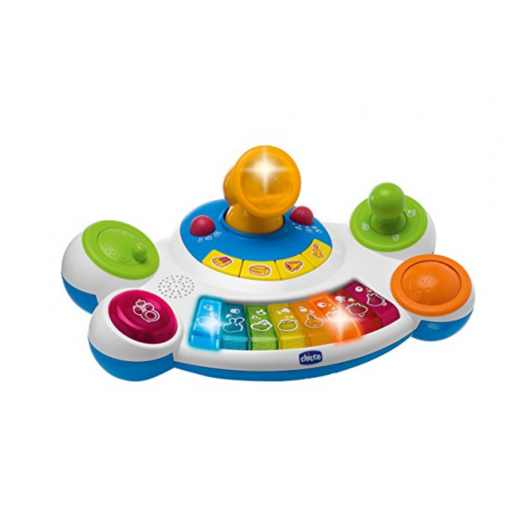 This funky keyboard is perfect for little fingers and features fun three play modes: Musical Scales, Pre-recorded tunes and Orchestra mode. Musical scales: press the keys to create your own music on four different instruments. Pre-recorded tunes: play nine fab songs. Orchestra mode: add or remove instruments from the pre-recorded tunes to work out which you like best. This brilliant piano also includes a drum button, light and sound effects and a scratch effect lever to add entertainment and create a range of tunes that will enchant everyone. This toy will help to develop coordination, motor skills, improve visual perception and music awareness . Help to develop coordination, motor skills, improve visual perception and music awareness .